Long before Charlie Sheen was making headlines for drug busts actor Robert Mitchum was making the front page as Hollywood's bad boy. During his lifetime, Mitchum would have a few encounters with the law. When Mitchum was just a teenager he had left home to live the hobo lifestyle, hopping trains going cross country. On one occasion in 1932, when Mitchum was sixteen, the young man hopped off a train at a stop in Savannah to get some food and was arrested for vagrancy. 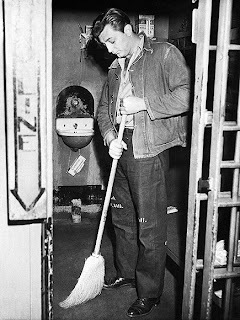 Mitchum was sentenced to serve on a chain gang. 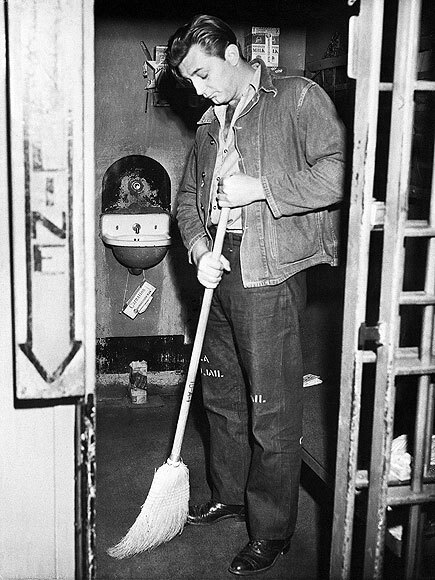 But, Mitchum was lucky that he was only busted for vagrancy. During his hobo days Mitchum picked up a lifelong habit of smoking marijuana. Sometimes during those long train rides the marijuana helped kill the boredom or when passing through northern states during the harsh winter months, smoking marijuana made the extreme weather conditions tolerable. Mitchum got to the point that during his train travels he could distinguish the different varieties of marijuana one could encounter. When Mitchum would make has way west to Hollywood his interest in marijuana went with him and would be the subject of one of his most notorious scandals. By 1948, Mitchum had become a recognizable actor, particularly with the bobby-soxer crowd who liked the bad boy image that he was beginning to be identified with. On August 31, 1948 an event would take place that would only add to Mitchum's reputation. Mitchum and his friend Robin Ford, a real estate agent, visited a young actress named Lila Leeds and her friend Vickie Evans at a house Leeds rented in Laurel Canyon. The four were taking turns passing around a joint when suddenly a crash was heard at the back of the house. A group of cops had made their way into the home and arrested the group for drugs. Mitchum and the rest of the party would be tried by Judge Clement Nye. Mitchum pleaded not guilty but Nye found them guilty, sentencing Mitchum to two years of probation, sixty days of which would be spent behind bars. Above is a photo of the Los Angeles Hall of Justice building in downtown Los Angeles located at 210 West Temple Street. The 14-story building was built in 1922 and housed the Los Angeles County Courts, Los Angeles County Coroner, Los Angeles County Sheriff's Office, and the Los Angeles County District Attorney. It was also the primary LA County jail until the 1994, Northridge Earthquake. The building was damaged in the earthquake and has sat abandoned ever since, although there are plans to move back into the building. It really is a nice looking building and is a shame that it is not being used. The Hall of Justice building was where Mitchum served fifty days in jail but Mitchum isn't the only well known personality to stay there. Bugsy Siegel, Charles Manson, and Sirhan Sirhan (Robert Kennedy's murderer) have all spent time at the Hall of Justice in the jails which were located in the top five floors of the building. In the basement of the building was the City Morgue and is where the autopsy of Marilyn Monroe was performed. Mitchum also served time at the Sheriff's Honor Farm north of Los Angeles. Most of of Mitchum's day was spent working on the farm making concrete blocks. The actor would wake at 5am, have breakfast, work until a short lunch break and then go back to work until the evening. During Mitchum's jail time, Howard Hughes, who was then in charge of RKO studios where Mitchum was under contract, was preparing Mitchum's post-jail career. While such publicity would kill the career of many actors Mitchum's star would continue to rise. The negative publicity probably boosted his career and in the eyes of some only reinforced the image they already had of the actor. A friend of mine recently referred me to this incredible documentary film called "Disneyland Dream" and I'm thankful that he did. The video, which documents the Barstow family's 1956 trip from Connecticut to California, is an amazing time capsule from that time period. In 1956, the Barstow family entered a contest presented by Scotch tape in order to win the prize - a fully paid trip to Disneyland. The Barstow family won of course and captured their magical trip on film. Some of the sites that you can see in the video include their 1950s home in Connecticut, the Huntington Shertaton Hotel in Pasadena, Knott's Berry Farm when it actually looked more like a farm than a theme park, Southern California orange groves, Grauman's Chinese Theatre, Hollywood and Vine, the Beverly Hills Hotel, the Walt Disney Studios in Burbank, Universal Studios Hollywood, Will Rogers's home, Catalina Island and a tour of the Disneyland theme park as it appeared back then. The video is about 34 minutes long but worth taking the time to watch until the end if your a nostalgia or Disneyland buff. The video uses the film footage from 1956 with an added narration track that Robbins Barstow, the father, created in 1995. Some of my favorite things in the video are seeing the family wearing their Davy Crocket jackets or boarding a TWA airplane that holds 64 people. The family is also quite amusing and with the narration provided by Robbins, you feel like you're right there with him as he retells this memorable experience. In 1938, after getting his start in New York, Earl Carroll would move his dinner theatre business to Sunset Boulevard in Hollywood, California. A show at the Earl Carroll Theatre, according to an early advertisement, included a chance to dance to "two famous orchestras, watch a CBS broadcast, and dine on superb dishes created by world-renowned chefs." For $3.50 you could enjoy all of the evening's entertainment plus a full-course dinner or for $1.65 without dinner. Another advertisement exclaims the theatre features "sixty of the most beautiful girls in the world." These girls would perform elaborate stage revues usually led by a popular star. During the 1940s, Hollywood was the nightspot destination for visiting servicemen. Like the Hollywood Canteen or the Florentine Gardens, the Earl Carroll Theatre welcomed many servicemen. You can imagine at the price of $3.50 you got more bang for your buck than you would have visiting some of the Sunset Strip nightclubs. The Earl Carroll Theatre would continue to be a popular nightspot until June 17, 1948, when Carroll died in a plane crash. Afterwards the club would struggle for a few years. In 1953, Frank Sennes changed the club into the "Moulin Rouge." Still a theatre and restaurant, the Moulin Rouge featured more Vegas Style shows and would last into the 1960s. Above is an image of the Earl Carroll Theatre building as it appears today. The building is now occupied by Nickelodeon studios. Grauman's Chinese Theatre had celebrity hand prints, footprints and signatures in the sidewalk in front of the theatre. The Earl Carroll Theatre had celebrity signatures on plaques on their "Wall of Fame" next to the entrance of the theatre. Some of the names on the plaques include Don Ameche, Rosalind Russell, Joan Bennett, Ray Milland, and Myrna Loy. Does anyone know where these plaques are today? One of the stars of the Earl Carroll Theatre shows was the beautiful Beryl Wallace who also happened to be Earl Carroll's wife. Wallace also died in the same plane crash as her husband. If you went to the Earl Carroll Theatre one of the souvenirs you could purchase was a set of "Hollywood Star Autograph Glasses." The set included eight different glasses with color embossed autographs of many of the popular actors and actresses of the time. The colors came in Red, Blue, Green, Orange, White, Maroon, Yellow and Black and each color had different celebrity signatures. Fred Astaire was on the green set, Humphrey Bogart on the orange, and Rita Hayworth on the red set for example. To purchase a set of these eight glasses would put you back $3.00. Does anyone still have a set of these glasses in their home? If you do, I hope they're on display and not being used! Above is an image of Frank Sennes Moulin Rouge. As you can see, the Wall of Fame is still on display outside the theatre. From the outside, the building did not change much from the change over from being the Earl Carroll Theatre to the Moulin Rouge, other than the signage. You can still go by the theatre today but now you will see all the Nickelodeon signage displayed on the building - and no Wall of Fame. As I mentioned before, I always like reading the messages on the back of old postcards. On the backside of the very first Earl Carroll Theatre postcard displayed at the top of this post it reads, "We are about ready to start our long trip back - this place is pretty but we haven't seen any movie stars." Postmarked in 1947 to a Mrs. Rose Kellerman & Sister in Memphis, Tenn. Even back then tourists were disappointed to not have any star sightings. Barbara Stanwyck knows how to play tough women and her role as Kathy Ferguson Doyle, in the 1957 film Crime of Passion, shows just how tough she can be. Stanwyck plays a San Francisco newspaper advice columnist. She is a working girl with grand ambitions in an era of stay-at-home housewives. Then one day Los Angeles detective Bill Doyle, played by Sterling Hayden, arrives in San Francisco to arrest a fugitive and meets Stanwyck. The two fall in love. Stanwyck abandons a career opportunity in New York to marry Doyle, move to Los Angeles, and become a suburban housewife. It doesn't take the ambitious Stanwyck long to lose her mind. She becomes restless with her husband who has no career ambitions and is content working just enough to live comfortably. Stanwyck also can't stand the other officer's catty, subservient housewives. Stanwyck wants to live a better life and if her husband isn't going to do anything about it she will - even if it means committing murder! 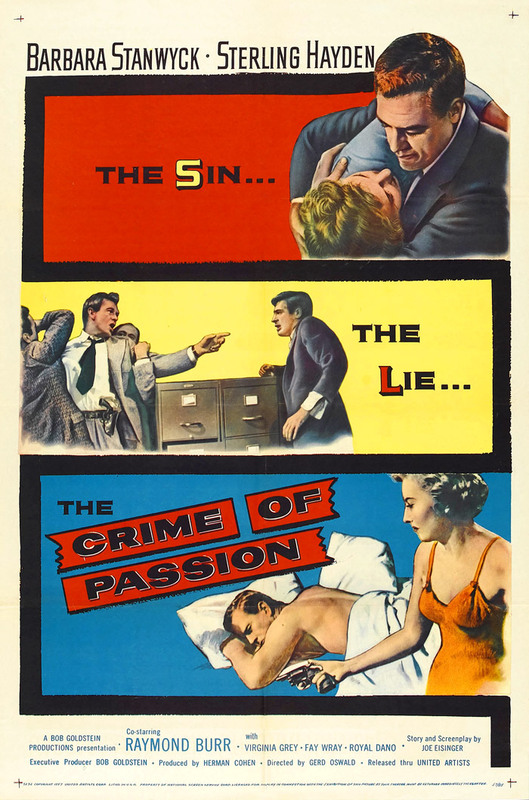 Crime of Passion is an interesting film for its representation of the 1950s woman and what her role should be. Should the 1950s woman be the submissive housewife? As Hayden's partner, Charlie Alidos, played by Royal Dano, says to Stanwyck, "your work should be raising a family, having dinner ready for your husband when he gets home." But that's not the kind of work Stanwyck wants. Even after she marries Hayden and takes on the role of the housewife she is still the dominant force in the household, telling her husband what he needs to do. When Stanwyck's husband doesn't work to get a promotion Stanwyck does it for him. She doesn't spend all day cleaning house and preparing dinner for her husband. 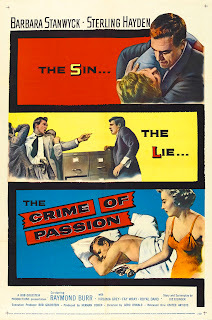 Despite the social commentary, Crime of Passion is a middle-of-the-road film - a bit too melodramatic for my taste. As always, my favorite thing about the movie is seeing Los Angeles in the 1950s. There are glimpses of downtown Los Angeles and some early Los Angeles suburban neighborhoods. There are also some great lines of dialogue. My favorite is an exchange between Stanwyck and Sara Alidos (Virginia Grey). At a party of police officers and their wives, Stanwyck and another wife are discussing a car accident she had been in. Grey keeps cutting Stanwyck off and says, "You know, I've been driving for twenty years now and I've never had an accident. Not one. Maybe a few near misses but nothing that was ever really my fault." Stanwyck replies, "You mustn't be discouraged Sarah - you must keep on trying." Snap! In one scene we see Stanwyck riding with Hayden down the 200 Block of East First Street in downtown Los Angeles. They are on their way to the Police Department. Above and below are photos showing First Street as it appears in the film and how it appears today. You will notice a dramatic change. The only building still standing from the 1957 screenshot is the building on the left with the red awnings. The other buildings have been torn down and replaced by a large hotel building. Below we see Stanwyck and Hayden entering the parking garage of the police department. The building on the far right is the police department and the building on the left is City Hall. Both the police department and City Hall buildings are still visible today, although, you will notice that gap in the skyline has since been filled by another building. Barbara Stanwyck home in the "Valley"
Above is a screenshot of Stanwyck and Hayden moving into their new house which is supposed to be located in the Valley. I really love this image! Look at all the newly developed homes with their manicured lawns and freshly planted trees. To top it off, look at that giant drive-in movie theatre screen in the background! How very 1950s suburbia. I would really like to see how this neighborhood appears today. Have the homes been kept up? Are the trees towering over the streets? One thing is for sure that drive-in movie theatre is not there. I think they're used to be about 5 or 6 drive-ins located in the Valley and I don't believe there are any still standing. Are there any readers out there who are experts on drive-in movie theatres who might recognize the one seen in this film? Since opening in 1936 until closing in 1995, Chasen's was a Hollywood institution. The restaurant, which used to be located at the corner of Doheny Drive and Beverly Boulevard at the edge of Beverly Hills, hosted the greatest stars ever to appear on screen. James Cagney, Pat O'Brien, Ralph Bellamy, Frank Morgan and the rest of their "Boys Club" would gather every Wednesday at Chasen's during the forties to eat, drink, sing, and catch up after their busy days working at the studios. In 1939, after Clark Gable and Carol Lombard introduced the newly arrived director from England, Alfred Hitchcock, to Chasen's, the director and his wife would have their Thursday night dinners at the restaurant. 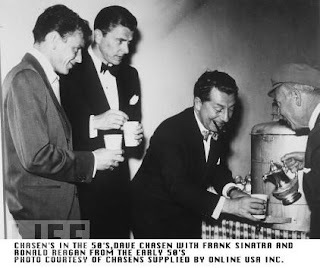 The Jimmy Stewarts, Don Ameche (who introduced owner Dave Chasen to his wife Maude), George Burns and Gracie Allen, Ronald Reagan, Bob Hope, Frank Sinatra, Jack Lemmon, Billy Wilder, David Niven, Fred MacMurray, Joan Crawford - well, nearly every major star from the Golden Age of Hollywood dined at Chasen's. One of Chasen's signature dishes was their chili. Elizabeth Taylor loved the chili so much that in 1962, while in Rome on location filming for Cleopatra, she paid $100 to have the chili shipped to her on dry ice! I love chili and knew I had to try the Chasen's chili if it really is that good. Although the restaurant has been long closed, the book "Chasen's: Where Hollywood Dined - Recipes and Memories" by Betty Goodwin, contains the recipe for this famous chili. Rinse beans again. Add enough fresh water to cover beans. Bring mixture to a boil. Reduce heat and simmer, covered, for one hour or until tender. Stir in tomatoes and their juice. Simmer five minutes. In a large skillet saute bell pepper in oil for five minutes. Add onion and cook until tender, stirring frequently. Stir in the garlic and parsley. Add mixture to bean mixture. Using the same skillet, melt the butter and saute beef and pork chuck until browned. Drain. Add to bean mixture along with the chili powder, salt, pepper and cumin. Bring mixture to a boil. Reduce heat. Simmer, covered, for one hour. Uncover and cook 30 minutes more or to desired consistency. Chili shouldn't be too thick - it should be somewhat liquid but not runny like soup. Skim off excess fat and serve. Makes 10 cups, or six main dish servings. The cook in the kitchen. I must say, this chili turned out amazing! I understand why Elizabeth Taylor had this chili shipped all the way to Rome. If you are looking for something hearty and tasty to make this winter and want to dine like a classic Hollywood star, I recommend giving this chili a try. For more of Chasen's recipes I recommend picking up a copy of Goodwin's book. In addition to the recipes are some intimate photographs of the stars who dined at Chasen's as well as some fun anecdotes about the restaurant.